Naval intelligence... Similar to the Schott's Men's Classic 32 oz. 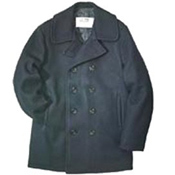 Peacoat, with a vented back and nylon quilted lining.